We’re delighted to announce that we’ve won a major national award for our Leaseholder Handbook, which provides easy-to-read information about our services, and leaseholders’ rights and responsibilities. The award is from the Association of Retirement Housing Managers (ARHM), whose mission is to raise standards by promoting best practice and ethics among private sector and registered social landlords. It has over 50 member organisations, of which we’re one, responsible for a total of more than 100,000 retirement properties across the UK. We received the award following an audit process by ARHM, in recognition of both our transparent, ethical business practices, and compliance with the ARHM Code of Practice. 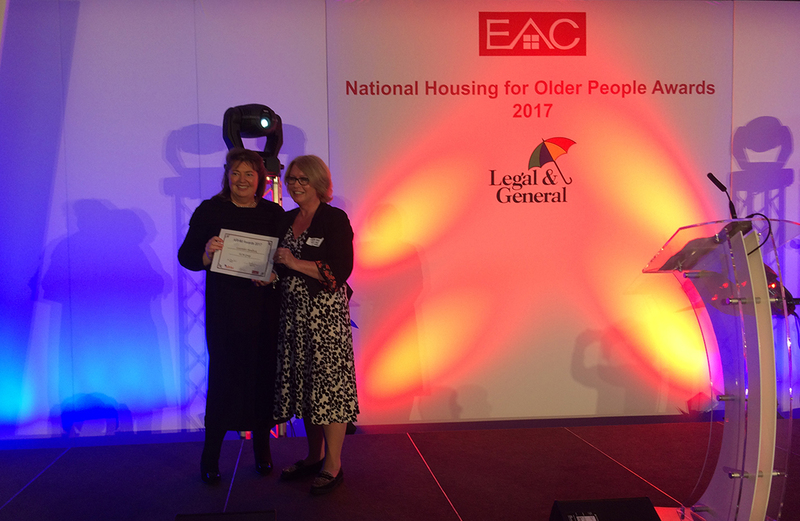 The award was presented to our Chief Executive, Lorraine Collis on Tuesday 16 May 2017 at the EAC (Elderly Accommodation Council) National Housing for Older People Awards event, which celebrates the best examples of housing for later life. Held at Edgbaston Cricket Ground in Birmingham, the event was attended by 300 guests, including residents from the winning schemes.